A healthy caesar dressing your skin will thank you for. First, it’s important to understand that dressings do in fact serve a nutritional purpose. Without healthy fats in your dressing, your body is unable to absorb fat-soluble vitamins including D, K, and A. Sadly though, so many store-bought dressings are overly packed with bad fats, sugar, and sodium, thus rendering them downright detrimental to your health. Good fats to include in a salad dressing include plant-based monounsaturated fats and polyunsaturated fats. (Think olive oil and avocado oil.) You want to avoid saturated fats or hydrogenated oils (e.g., canola oil and hydrogenated soybean oil). The heating process in hydrogenated oils makes them more shelf stable, but changes the chemical structure in the process. In addition to bad fats, many store-bought dressings include high amounts of sugar and sodium for flavor. The combination of bad fats and high sugar adds free radicals to your diet, which can result in skin damage and aging. This recipe is inspired by HUM’s OMG! 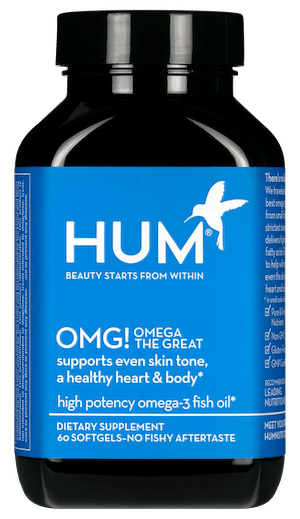 Omega The Great supplement, which combines high-quality, sustainably sourced fish oils for even skin tone and hydration. Omega-3 fatty acids are also excellent for reducing inflammation, heart health and brain function. One of the biggest complaints people have about fish-oil supplements is the fishy aftertaste. We’ve eliminated that in our supplement through quality sourcing and manufacturing to ensure freshness. For an extra measure, we also include a natural citrus flavor in our fish oils, which pairs perfectly with lemon and anchovy in this classic caesar recipe. Anchovies are a good source of protein, low in heavy metals, and a natural source of vitamin D. As opposed to adding free radicals, this nutrient-dense recipe full of healthy fats fights wrinkle-causing free radicals and reduces inflammation for healthy, glowing skin. Add garlic, apple cider vinegar, dijon mustard, veganaise, olive oil, lemon juice, and anchovy to a blender. With scissors, cut the end off of each OMG! Omega the Great fish oil softgel. Empty contents into blender. Blend ingredients together and add black pepper to taste. Enjoy this dressing over your salad or use as a healthy dip for veggies!